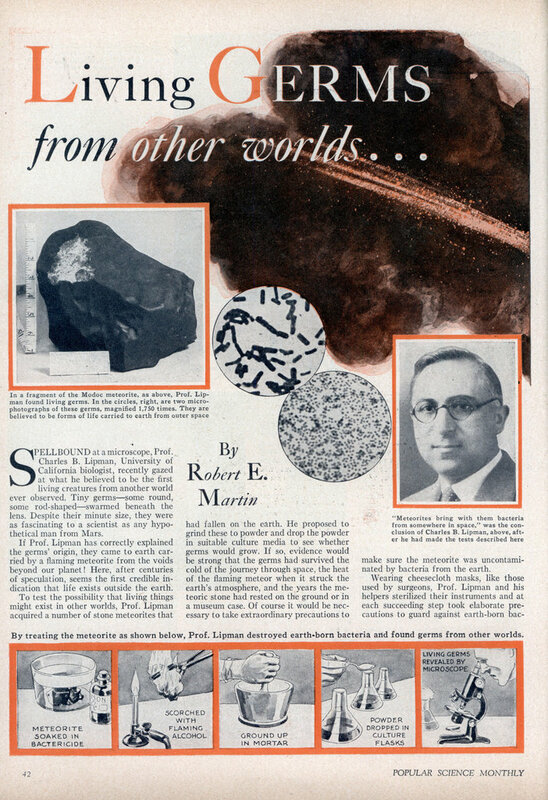 Apparently we discovered alien life in 1933. Nobody every bothered to tell me. SPELLBOUND at a microscope, Prof. Charles B. Lipman, University of California biologist, recently gazed at what he believed to be the first living creatures from another world ever observed. Tiny germsâ€”some round, some rod-shapedâ€”swarmed beneath the lens. 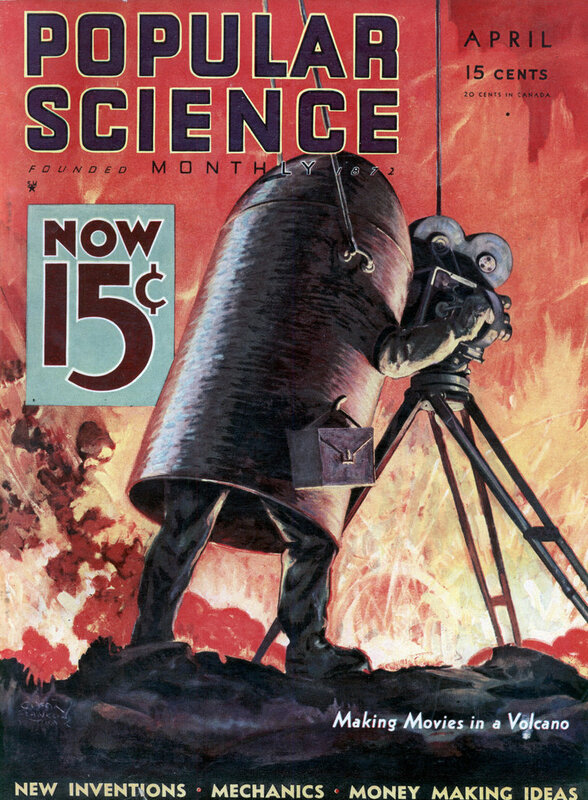 Despite their minute size, they were as fascinating to a scientist as any hypothetical man from Mars. If Prof. Lipman has correctly explained the germs’ origin, they came to earth carried by a flaming meteorite from the voids beyond our planet! Here, after centuries of speculation, seems the first credible indication that life exists outside the earth. To test the possibility that living things might exist in other worlds, Prof. Lipman acquired a number of stone meteorites that had fallen on the earth. He proposed to grind these to powder and drop the powder in suitable culture media to see whether germs would grow. If so, evidence would be strong that the germs had survived the cold of the journey through space, the heat of the flaming meteor when it struck the earth’s atmosphere, and the years the meteoric stone had rested on the ground or in a museum case. Of course it would be necessary to take extraordinary precautions to make sure the meteorite was uncontami-nated by bacteria from the earth. Wearing cheesecloth masks, like those used by surgeons, Prof. Lipman and his helpers sterilized their instruments and at each succeeding step took elaborate precautions to guard against earth-born bacteria, as shown in the illustration at the bottom of page 42. So drastic was this treatment that it probably killed some germs within the meteorite as well as outside, yet some survived and grew and reproduced beneath the experimenter’s eyes! So startling is his conclusion that meteorites bring germs to earth, that bacteriologists cannot accept it until it is verified by future independent investigators. Doubts have already been raised. Yet Prof. Lipman himself answers many of them. A flaming meteor may remain cold inside during its brief plunge to earth, so germs within it might survive; that they can survive passage through the extraordinary cold of outer space is also known, since recent tests at the University of Toronto showed germs could live after weeks of exposure in liquefied helium to a temperature of 450 below zero. Possible contamination from the soil? Some of the meteorites were picked up sterilized immediately after landing upon our earth. If the germs rode to earth on meteors, where did they come from? Some meteorites are members of our own solar system; others may be strays from space beyond. Other evidence alone limits the absorbing speculation of where life might exist in the universe. Of the nine planets now known in our own solar system, only the earth, Mercury, Venus and Mars could conceivably support life. The others are too cold, while Mercury may be virtually eliminated as too hot. Venus, recently discovered to have an appreciable atmosphere, might support creatures adapted to great heat. Mars is the most likely possibility, and recent tests of its temperature and atmosphere show it even more favorable to life than once imagined. There may be thousands of other solar systems like our own, each capable of supporting life and possibly human beings. Any attempt to imagine what sort of creatures inhabit these worlds has always been pure fancy; hence the unusual interest in the germs found by Prof. Lipman. Could they be disease germs? Bacteriologists doubt that possibility; they point out there is less than one chance in a trillion that germs capable of attacking an earth-dwelling being might have evolved on other planets. Bacteria look alike, but it is possible to identify and classify a new kind by delicate chemical and physiological tests. Dr. Lipman believes most of the germs he has found in meteorites are closely similar to those on earth, if not identicalâ€”an observation lending plausibility to the idea that other and higher forms of life outside our planet may be like our own. Tracing such forms of life, from the germs just found, will prove a thrilling adventure for the experimenters of the future, and will open new Velds of investigation.